To get rid of scabies and make sure it doesn't come back, you need to carefully treat every member of the household and household items like bedding and clothing, all at the same time. Members of the household need to be treated with creams or lotions called scabicides. The most common one is permethrin, which is available on prescription from your GP. Permethrin is safe for infants and pregnant or breastfeeding women. Follow the specific instructions on the medication package. The instructions are likely to include these steps. Apply the lotion to every member of the household. People who live outside the house who have close skin contact with members of the household should also apply the lotion. It's important that everyone applies the lotion at the same time, even if they don't have a rash or itch. Massage the cream over the whole body, including the ears, scalp, hair, neck and face. This is particularly important for young children who are more likely to have scabies above their neck. Avoid the eyes and mouth. Pay special attention to between the toes and fingers and under the nails. Use a soft brush to get under the nails. When anyone washes their hands in the next 12 hours, they must reapply the lotion. Wash the cream off 10 to 12 hours later. Reapply permethrin one week after the first application even if the members of your household don't have any symptoms. Household members can return to work or school one day after treatment. Treat all fabric items that household members have worn or touched in the last four days. Where possible, wash all items. 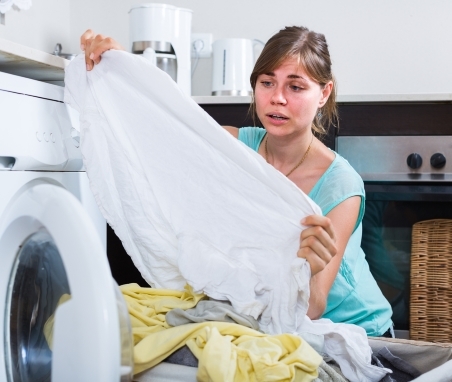 Dry them in a clothes dryer for at least 10 minutes or iron them with a hot iron. The scabies mite isn't small enough to go through the weave of sheets. You don't need to wash mattresses, pillows and underblankets if you've used sheets and pillowcases. Vacuum carpeted floors and upholstered furniture. Spray fly spray over furniture and beds where sheets haven't been used and avoid human contact for four days. There are several things that could stop the treatment working or make it look like the treatment hasn't worked. If you don't follow all the treatment steps, you might not get rid of the scabies. It's also possible that someone who hasn't been treated could reinfect the household. If this happens, there's a risk that you might think the scabies treatment didn't work because the rash and itch have a different cause. Even if the treatment worked well, the itch usually continues for up to six weeks. This can be confusing. If the itch continues, people can assume the treatment didn't work, or something else is causing the itch. If you believe that you completed the treatment correctly for the whole household, try to wait until the itch goes away. The treatment might not have worked because the diagnosis was wrong, and the rash and itch have another cause. Go back to see your GP two to three weeks after treating your household if the symptoms haven't gone away. Go back to see your GP if the itch doesn't go away after six weeks or comes back.